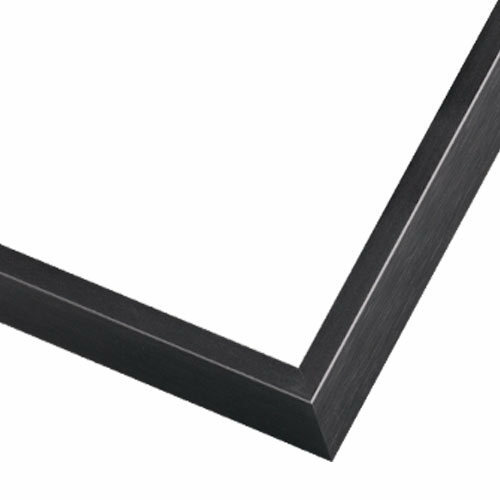 Your art will look museum worthy in this black shadowbox picture frame. It’s a Photographer’s choice for Cibachromes, RC prints and other delicate media. The finish has a gentle cross-brushed texture and it’s a lovely choice for the home or gallery. Top quality for an affordable price. Customize your size to 1/8th of an inch! Call to order the acrylic front: 800-332-8884. I like this frame when I don't want to get a mat for the picture, but I don't want to risk having the picture adhere to the glass or acrylic..
"Pictureframe" has only one - ( 555BLK ) this type of frame, very good to frame pastels, were pastel artwork is far away from glass or acrylic. I like if you have in future more this type frame in different colors and profiles. Nice to find this style . Excellent quality and price. Pleased to find this frame style I’ve been searching to find for quite a while. I happily ordered and the order indicated a delivery in about a week and a half which was fine. I was amazed when I received the frames two days later! Wow. Great selection, quality, prices, and delivery. Will definitely re-order and tell my artist friends. I needed a frame with a very thin face. Need separation between glazing and art work. Puzzling that you don't sell glazing for this order. Probably because your glazing is too thin. To match other frames I've purchased from you before. Looking for an economical solution for some odd shaped items - tea towels from New Zealand. This company is one of the few that has a low profile shadow box frame (glazing separate from the image). Thanks! Needed a metal frame for a large print, no mat. I don't like using mats and this frame keeps the glass off the print. BEST ANSWER: Hi Mike. You do have the option to have acrylic with this frame. You would need to call our customer care team to order it. They are available at 1-800-332-8884. Thank you and happy framing! ...Does it automatically come with glass? Absolutely not. You have the option to add glass, but it does not "come" with glass or acrylic. Look for the box to check that will add glass for an additional fee. I didn't order that way - I supply my own glass and don't use acrylic ever. No it does not. I believe you can order the glass separately. No, it does not come with glass or acrylic. BEST ANSWER: Hello. This is a metal frame that is shipped unassembled. Thank you for your inquiry. This is an anodized aluminum.